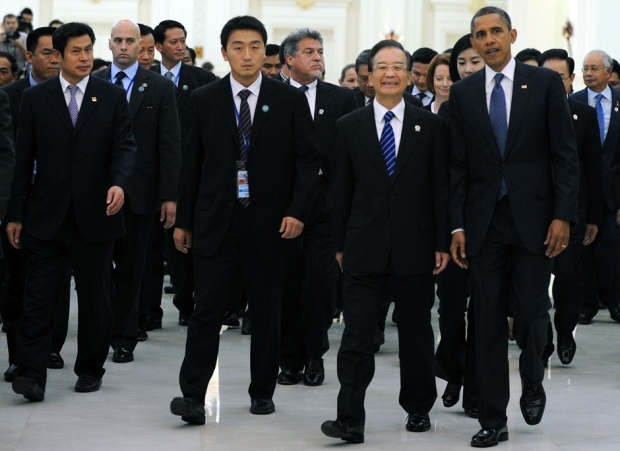 U.S. President Barack Obama, right, and Chinese Prime Minister Wen Jiabao, second from right, walk together at the 7th East Asia Summit in Phnom Penh on November 20, 2012. A new phase of Sino-American relations is poised to begin now that Xi Jinping has been confirmed as China’s next leader and Barack Obama re-elected U.S. president. In both countries, the debate about foreign policy options has been robust, particularly about the bilateral relationship. This is the time to reflect on the past and look ahead to the future. The transfer of power has been smooth for both, with no noticeable change in the conduct of either’s foreign policy. Over the past year, China has advocated a win-win relationship of mutual respect between a superpower and an emerging power. It was the approach Xi outlined on his visit to the United States in February and reiterated at November’s Party Congress. Meanwhile, Obama introduced the policy of rebalancing in his first term and has been taking steps to effect this “pivot” towards Asia. The Sino-U.S. relationship has never been more important, and hope is high that Obama and the new team of Xi and Li Keqiang will do more to forge a relationship of co-operation, rather than confrontation. The relationship has been highly transparent so far, and we’ve not seen the kind of misunderstanding, friction, or behavior to “test the water” so common with new administrations. But the lack of strategic trust remains a huge challenge for both. From Beijing’s standpoint, Washington’s rebalancing strategy has brought uncertainty to the region. The disputes over the Scarborough Shoal and the Diaoyu Islands, as well as other rows between China and its neighbors, can be understood in this context. America’s determination to be a key player in Asian security has emboldened regional countries to lean on it. The result is, when involved in a row with China, these countries have become unlikely to compromise. Washington has repeatedly said it takes no side in the Sino-Japanese dispute over the Diaoyus. But if Japan had not been a U.S. ally, would it have acted the way it did? Of course, without the U.S. security guarantees, nationalism in Japan might grow even stronger and the calls to rearm through a change in constitution even louder, and that would destabilize the region. The U.S. presence in Asia will only grow now that the Americans are slowly extricating themselves from the Middle East and Afghanistan. This is throwing a spanner in the works of China’s relationship with the rest of Asia, particularly its neighbors. U.S. officials and analysts like to describe the bilateral relationship as one of co-operation and competition; in the context of China’s relations in its neighborhood, Washington and Beijing are clear rivals. China is prepared to meet the challenge, but it should also fully prepare for any crisis. Moreover, Chinese diplomacy in the region must be more proactive to shore up the country’s influence. The striking feature of a rising power is its expanding interests, which may easily lead to conflicts with the dominating power. As the world’s two largest economies, China and the United States must seek new ways of relating that benefit not only themselves but the rest of the world. How, then, should China respond to the U.S. pivot to Asia? It has been China’s policy to base its relationship with its neighbors on economic opportunities. Through trade and investments, China has sought to share the fruits of its growth with others in the region, and in this way built a foundation for peaceful co-operation. This effort must continue. But, as the challenges thrown up by America’s strategic rebalancing have shown, a relationship built strictly on economic co-operation is not enough, and political and security concerns must also be addressed. In fact, a close economic relationship often creates such concerns. America’s policy in Asia is founded not on economics, but on a vision of a secure and stable strategic order in the region. That this vision of a common good—coupled with the values that America likes to champion—is attractive to countries in the region is unsurprising. Thus, in some sense, the Sino-U.S. rivalry is really one fought on values. In this regard, China needs to strengthen its dialogue with its neighbors on politics and security matters, establish bilateral or multilateral security mechanisms, and do much more to dispel their doubts and worries. This is nothing short of a competition between the American Dream and the Chinese Dream. China has to adjust, elaborate, and strengthen the substance of its Chinese Dream to increase its moral appeal to others. Once this missing piece of the puzzle is filled in, Chinese diplomacy will have found a new lease on life. Before this can be achieved, however, China should first successfully tackle its domestic challenges and deepen reforms at home. In other words, its diplomacy—built on the strength of its values—is but an extension of its internal policy.